Hello again and we hope everyone enjoyed their 4th of July! Today we are going to take a little bit of time to talk about batteries. If you do any sort of dry camping at all, you know that batteries are the foundation for whether you are going to enjoy your time or be miserable. Here are some quick tips on how to make sure your batteries are not a problem. Don’t leave your coach plugged in all the time. Keeping your coach plugged in all the time will not only overcharge your batteries and reduce their lifespan but it will also put extra wear and tear on your converter which will shorten its lifespan too. We recommend plugging your coach in for about a week to two weeks before your trip to make sure you have a good charge and then plugging it in for the same amount of time when you get back to replenish. Once you get back from your trip and have plugged it in for a week to two weeks unplug it and disconnect the batteries to store it. Leave it disconnected and unplugged until about a week to two weeks before your trip. Keep in mind that deep cycle batteries discharge at a very slow rate. This is good for RVing as it allows the batteries to give you reliable power for longer periods of time. However, these batteries also take a long time to charge back up. Do not rely on your monitor panel, when after a couple of hours it says your batteries are charged. The monitor panel only reads a top charge which goes very quickly. Therefore, it is important to let your batteries charge for days to weeks when they are low. Never run your batteries completely dead. Running your batteries completely dead results in losing a significant amount of its life cycle. Always keep track of where your batteries are at and never let them go below 50%. Replace your 12 volt deep cycle batteries with 6 volt deep cycle batteries. Having two 6 volt batteries hooked up in series creates a 12 volt bank that has the amp hours equivalent to three 12 volt hooked up in parallel. The 6 volt batteries are also much better batteries and have much longer life spans as well. Overall, if you are a dry camper 6 volt batteries are a must. Add solar panels to your coach. Solar panels will greatly increase the amount of time that you are able to dry camp, and they are great battery maintainers for when you are stowing your RV. Come see us about options for solar. 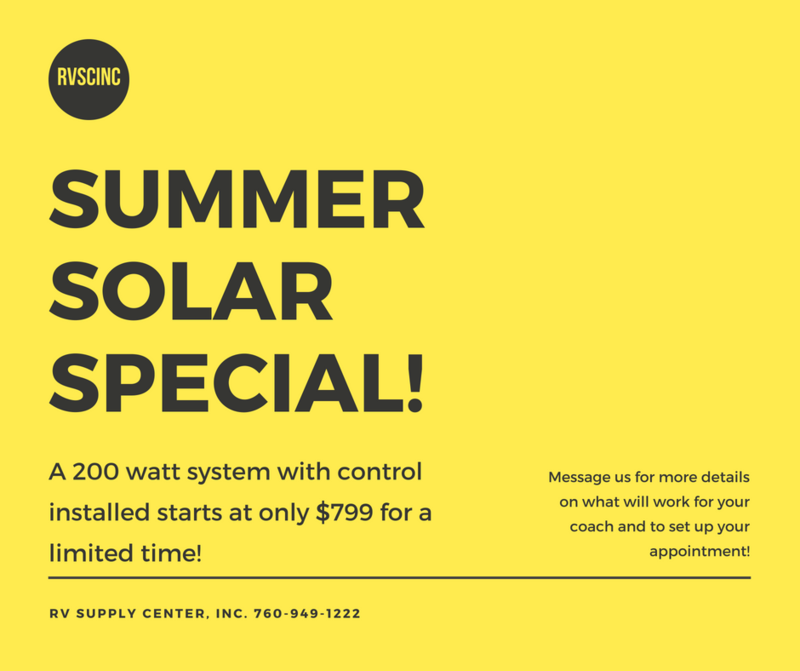 A 200 watt system with control installed starts at just $799. That’s our summer special so come see us soon to take advantage of it while it lasts! Check your battery water levels at least every 30 days. This will also greatly increase the life of your batteries. Add only distilled water whenever the water levels are low. Letting the plates on your batteries get exposed ruins the battery and results in having to shell out the money to replace them prematurely. If your batteries are difficult to reach come in and see us about an easy to use battery watering system. Check for and clean up corrosion on the batteries and the cables. You can do this at the same time you are checking your water levels. Corrosion can cause bad connections and create power issues if not addressed. Just use a wire brush to clean it all up and spray battery cleaner on any spots that have this issue. Hopefully these tips are helpful to you. Please feel free to share if you think we have missed anything or if you have a battery routine that you might feel is helpful. You can let us know by commenting on our Facebook page. We hope that everyone had a safe and fun 4th of July!